In part one we have showed the full pages of the Photo album that Marcia Campbell put together for Sam Barris. 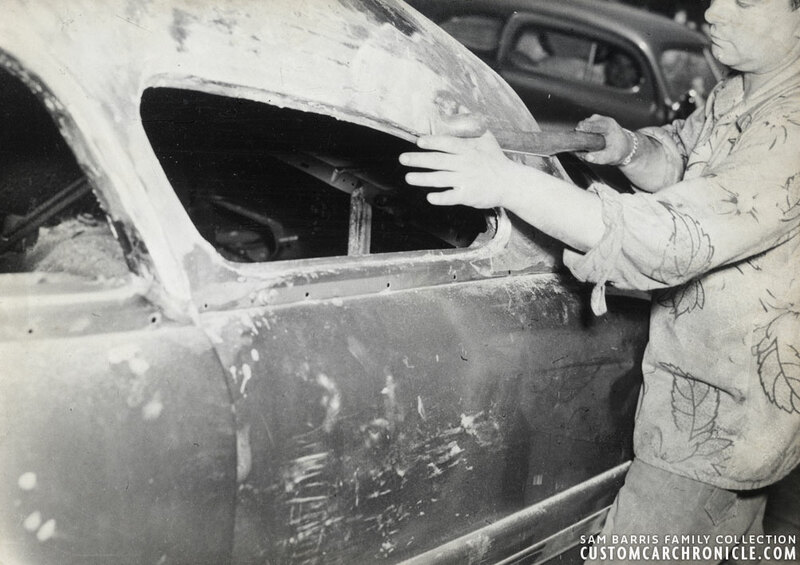 An album showing Sam chopping a 1949 Mercury. Now lets take a closer look at the photos. 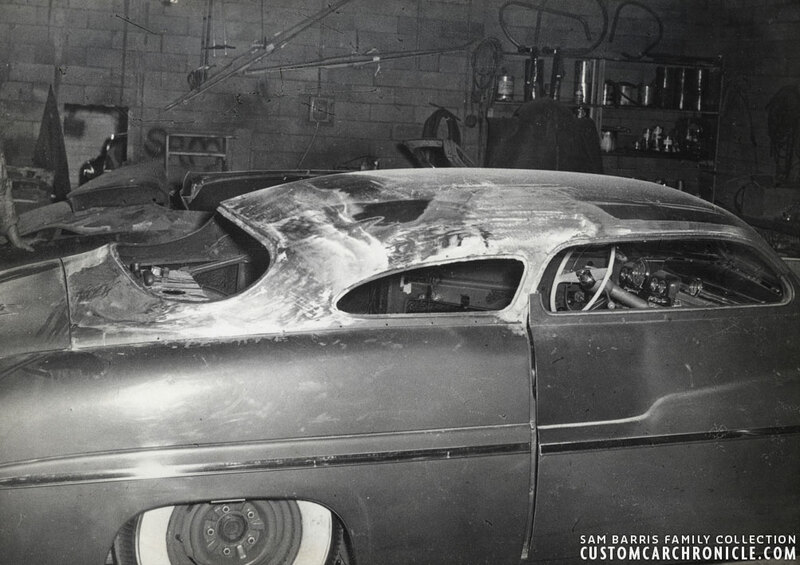 The photo album Marcia Campbell put together of photos she took of Sam Barris chopping the top of Jerry Quesnel’s ’49 Mercury is not only wonderful to look at. It is also very important for the history of the Custom Car. 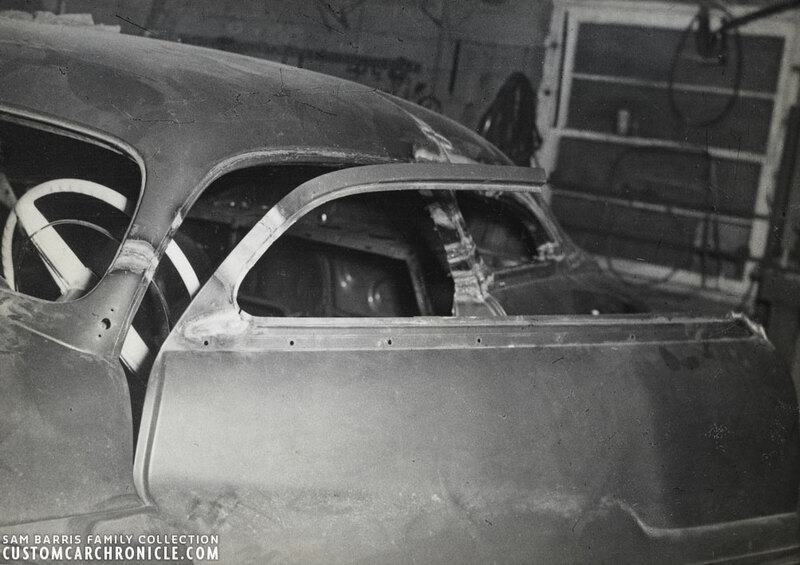 It is as far as we know the first time that the chopping of the king of all cars to be customized, the 1949 Mercury Coupe gets a chopped top. The album captured Sam Barris most likely cutting one of these cars for the very first time. As far as I have been able to research it Sam worked on Jerry’s Mercury and his own Mercury just days, perhaps a few weeks apart. And according those who where there at the time (including the late Jack Stewart) Jerry Quesnel’s Merc was done first, in primer. 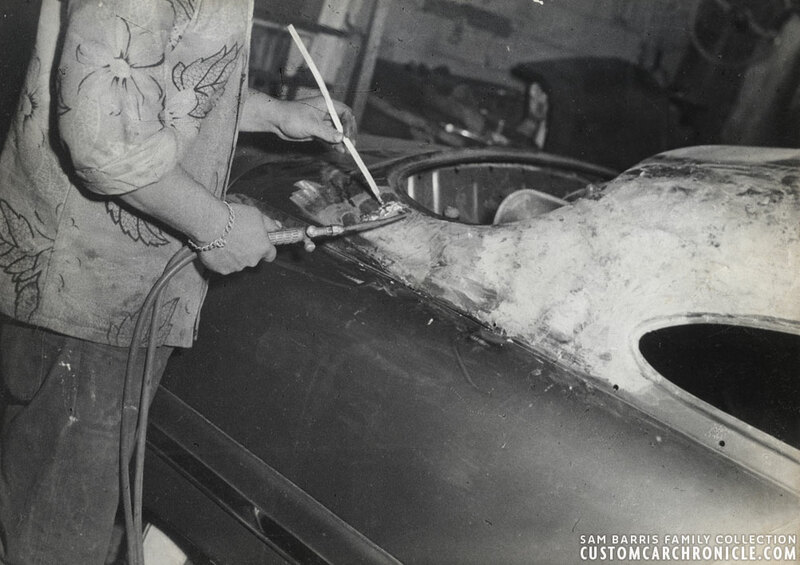 And more than likely Sam’s got the full paint and finish treatment the first, since Sam had plans to have a finished car at the Oakland Roadster Show in February 20-25, 1951. 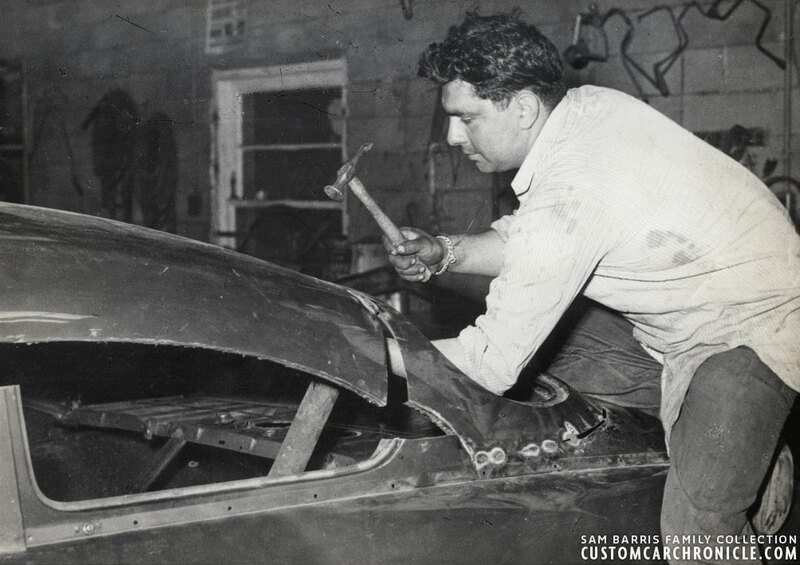 The photos show that Sam Barris had a completely different approach to chopping the top of Jerry’s Mercury than we have today. 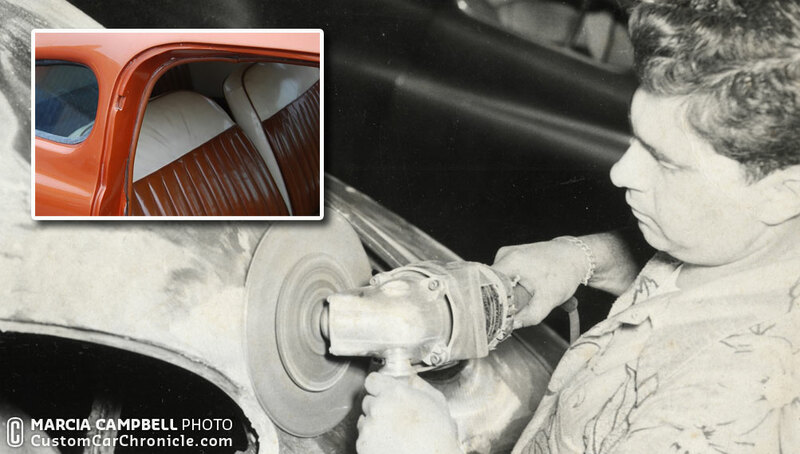 Possibly the way Sam chopped the top on this Mercury was based on what he was used to do on the pre ’48 Ford’s and Chevy’s. 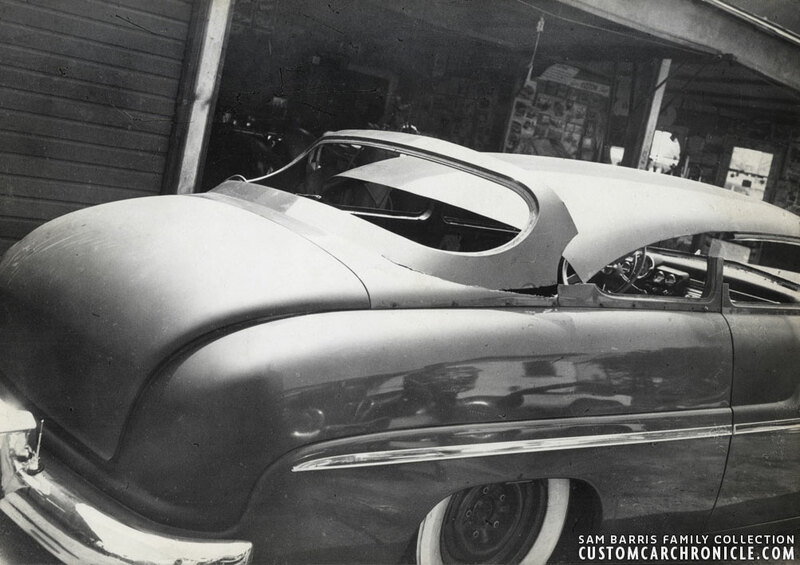 We know that the Barris Kustom Shop was using pre-shaped panels created by California Metal Shaping for restyling panels including fade away fenders. It is unsure why Sam did not use this technique to chop the top on Jerry’s Mercury. But instead choose to use lead to fill the dip from the rear window to the rest of the roof. 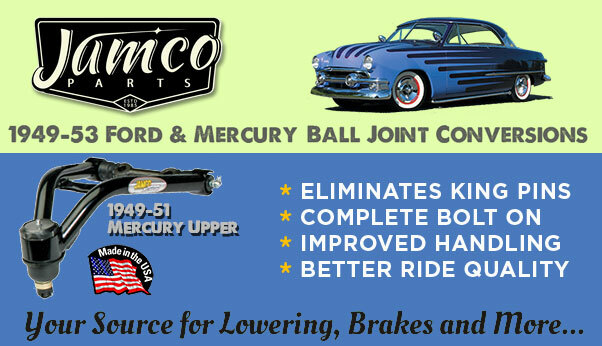 Sam chopped Jerry’s Mercury with a completely reshaped and forward angled B-pillar. 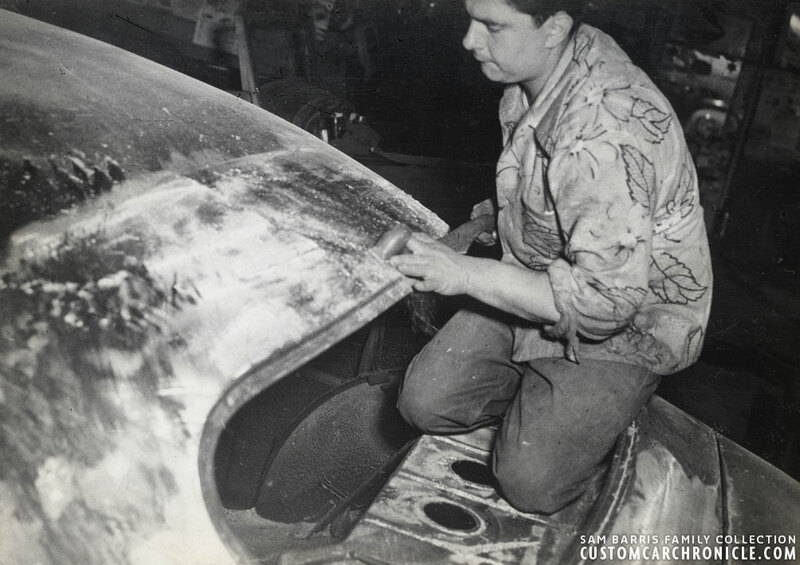 Before I had seen these Marcia Campbell photos of Sam working on the B-pillars I always thought that possibly Sam had used an extra set of door frames to create the forward angle on the B-pillar. Using a set of front corners flipped from side to side. But the photos in this series actually show that Sam cut and welded the original door frames in such a way that they looked a lot like the front corners. We come back to that in the next part. 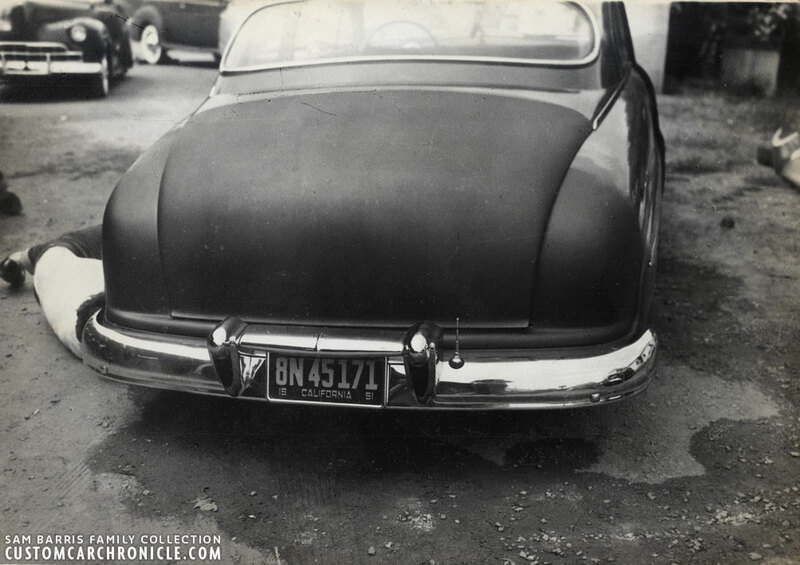 The earliest photo included in the Marcia Campbell created album is this rear view of Jerry Quesnel’s ’49 Mercury with the distinctive bumper guard taillights and antenna location. 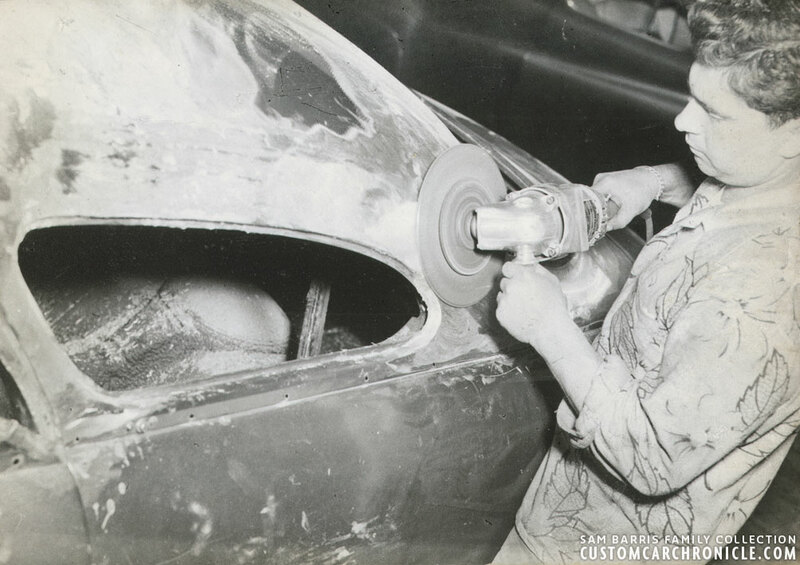 The body work needed for the shaving of the trunk and the removal of the taillights from the rear fenders had already been done prior and was covered in primer. On the left we can see the Jesse lopez 1941 Ford in the drive way of the Barris Shop, perhaps the car had already been sold to Danny Lares by then. The Barris “small office” building is in front of Jerry’s Merc. The roof cut off completely, and so are the door tops. Material has been removed from the A-pillars and the roof put back on to check if the right amount had been removed. Notice that the door handle already had been removed by then, and the car was already lowered. The last helped getting the chop proportions just right. Early stages of the chop work was done outside where there was more space to move the top around. Notice that there were no braces added inside the car! Taken around same moment as the previous photo but then from the rear. 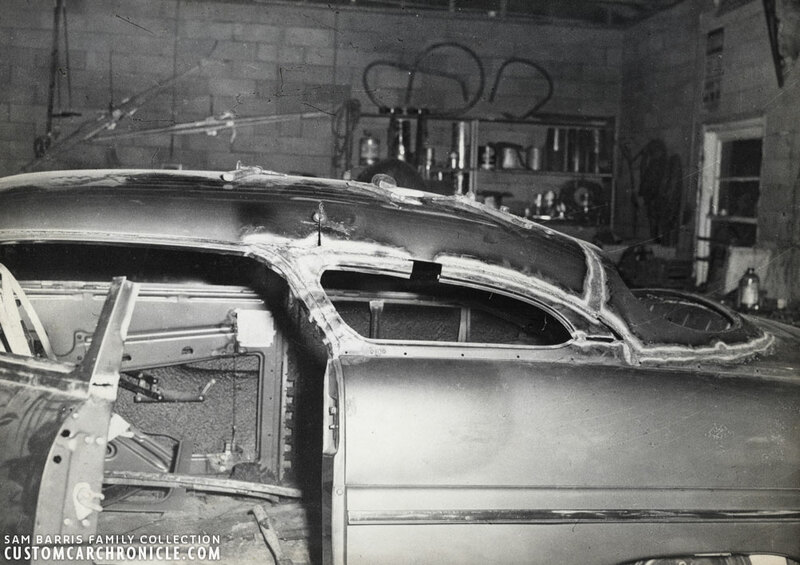 This photo shows that the rear window surrounding metal has been cut from the roof, and lower corners. The top portion of the rear quarter windows and the whole top section of the B-Pillar have been removed at the drip rail. Sam removing some material below the corners of the rear window to allow the rear window to lay forward. The whole section around the rear window was cut loose, except the center section. The top is just resting on the lower portions of the C-pillar. the top would in fact be mounted higher than what we see in this photo. Wonder who’s ’40 Ford that was in the background. Removing material from the lower C-pillars, also to be able to lay the rear window forward to flow with the rest of the top. The car is now moved inside the shop. Most likely the A-Pillars had been tacked in place by now, and the flow of the top was figured out. 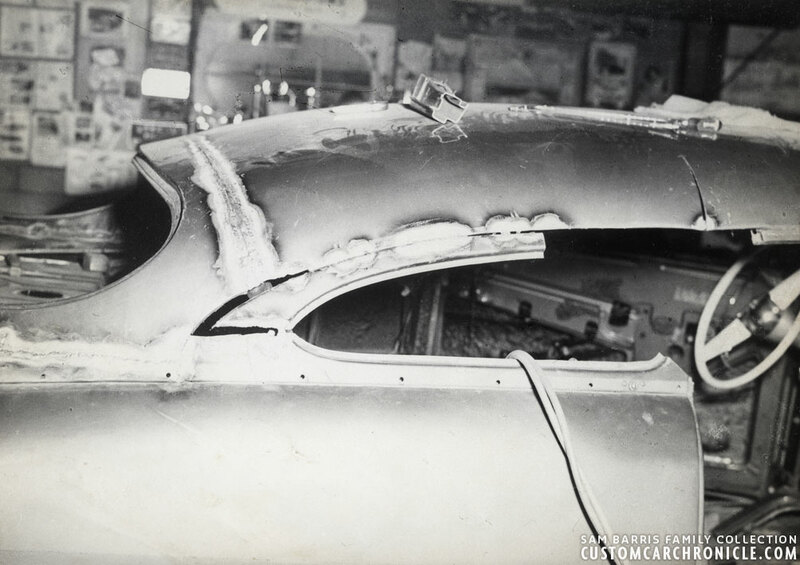 To be able to flow the bulbous rear section of the roof into the much lower rear window Sam made a relieve cut on the round edges of the top, on both sides at the height of the B-Pillar. The rear portions was pushed up and the cut now had a v-shape. Sam is welding a spacer piece of metal into the v-shape section in this photo. The helper makes sure the center of the top is not sagging during the process. 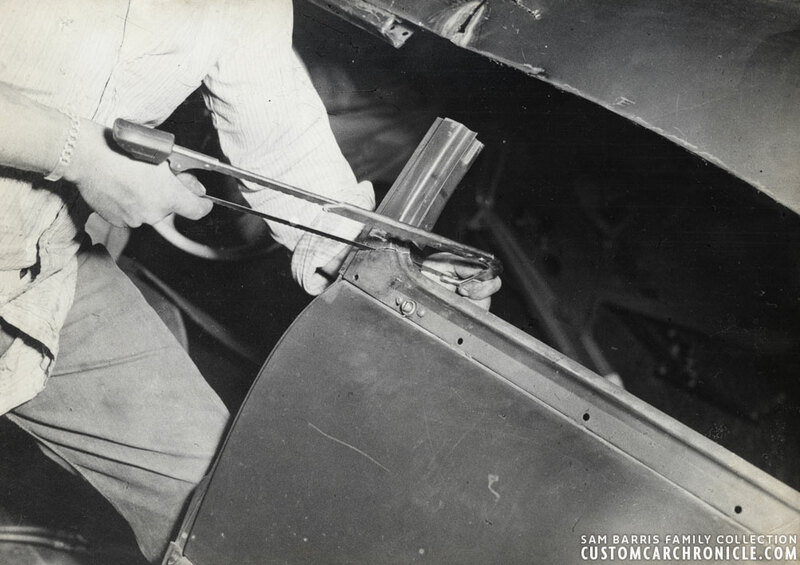 Large diameter tubing (possibly an old exhaust) was set inside to hold the top in the right position while Sam had tacked the rear of the top and the rear window section together. 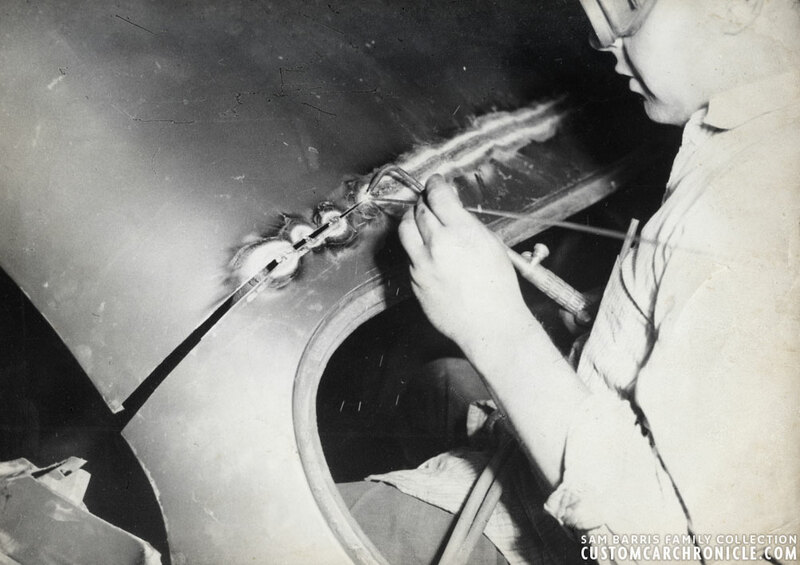 Sam is seen hammer welding the seem in this photo. The center section of the top to rear window already has been welded completely. am is now working towards the sides. It is amazing to see that Sam only used a few small wedge pieces of metal to create the top. Here the filler pieces have been added to create a solid C-pillar. Notice the low spot from the top towards the rear window. This photo shows the cut in the roof sides needed to move the rear section of the top up. After the rear was moved up the cut had become pie-cut shaped. The filler piece that Sam welded in place makes sure the shape stays the way it needs to be. Time to cut off the -B-pillar lower section to allow it to lay forward. 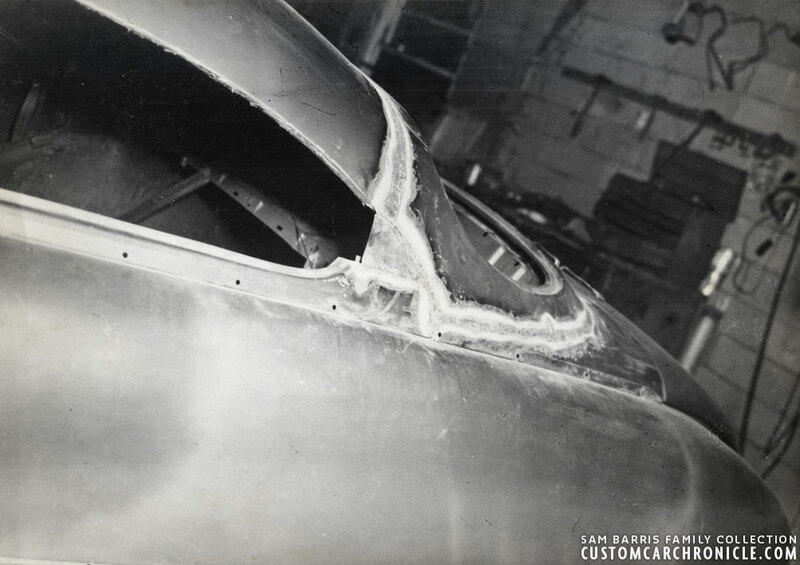 The previously removed top sections of the rear quarter windows have the front section cut off and the rear section was cut at the back to make it fit to the top with the new much lower profile. Same thing was done on the drivers side, here we can see that the B-pillar section of the rear quarter window tops now has been tacked to the top as well. To allow for the angled forward B-Pillars the window opening top section had to be streched. This photo shows how much metal needs to be added. Sam had to make several cuts into the B-pillars to be able to get them to angle forward as much as he and Jerry wanted. The plan was to mimic the shape of the front corners of the window frames, very much like some GM cars from the mid/late 1940’s. The filler piece in the rear quarter window tops and C-Pillar have been created and the relieve cut on the roof sides has been welded. It is amazing that the shape of the rear quarter window was created without having the door tops in place. The A-pillars have been welded, and a relieve cut has been added to the front lower corder of the window opening. This had to be done to get the top of the door frame in line with the new angle of the A-pillar. When a section is removed in a cone shaped object and the top section dropped the sides will need to be set at a slightly steeper angle to make it all work. Starting to put back the top section of the door window frame. But the rear portion has to wait a little, next up is adding lead to the body work of the top. Time to add some lead to make everything smooth again. Using no replacement shaped metal section to create the smooth curves needed for this shop made it necessary to ad heavy layers of lead in some placed. Especially above the rear window. 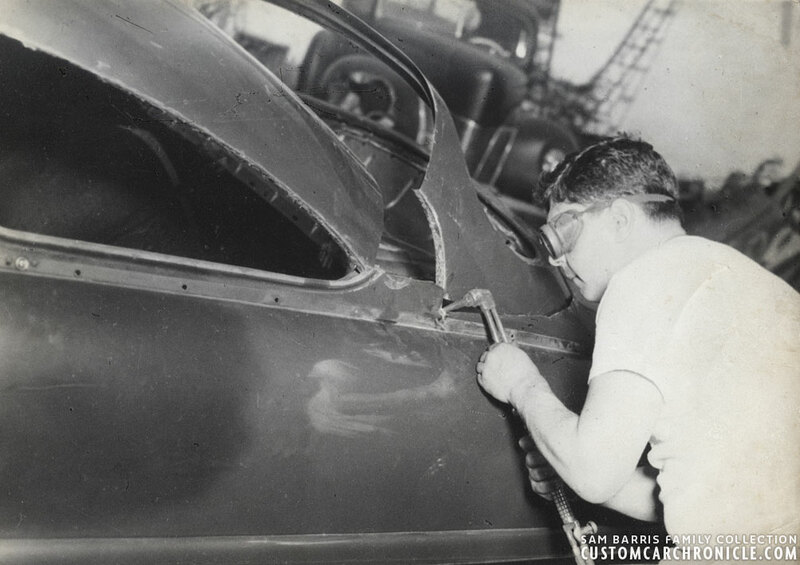 In this photo Sam is adding lead to mold the rear window surround to the turret panel. 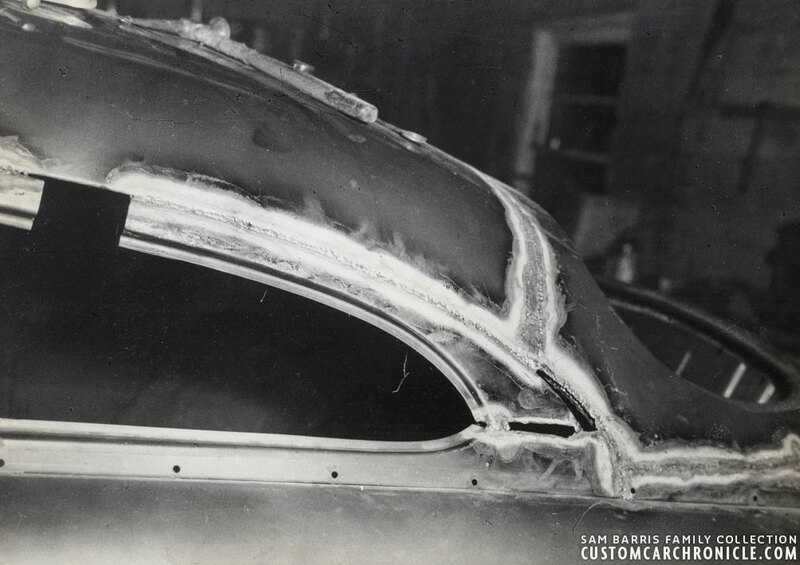 The whole rear quarter window and its surround was covered with lead. The lead in the process of being filed, shaved and sanded. Notice that the passenger door window frame still had to be done when Marcia took this photo. Sam sitting on the package tray shaving the lead above the rear window in shape. Next Jerry’s Mercury was taken outside again for more shaping and sanding. Marcia Campbell took this photo of Sam filing the freshly applied lead from the C-Pillars. In the back ground we can see the passenger door of the Jack Stewart’s 1941 Ford. That Jack’s Ford shows up in this photo is actually really important to date this series of photos. Here Sam is sanding the lead filler smooth for the next step, primer. Notice how the C-pillar is still missing from the door in the lower left corner of the photo. In the background we can see the Jack Stewart Ford again. 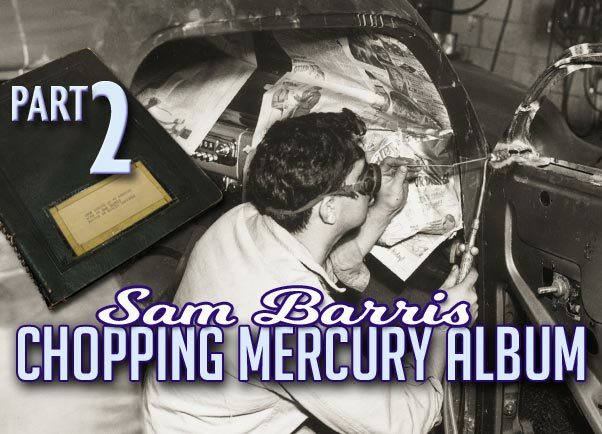 We do not know exactly when Marcia Campbell took the photos of Sam Barris chopping the Jerry Quesnel ’49 Mercury, we also do not know when she created the album for Sam. The Album, nor any of the photos inside show a date. But with careful examining the photos in the album we have narrowed the time frame when these photos were taken down to around a few weeks. Timing these photos is important since there still is the question of who chopped the iconic ’49 Mercury Coupe for the very first time. 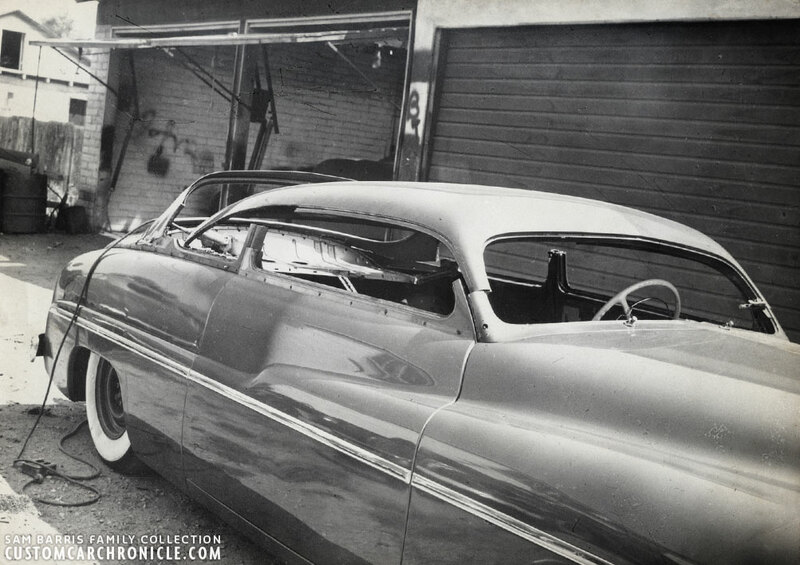 One of the first photos in the album shows Jerry’s Mercury before it was chopped with 1951 California License plates. Still these photos could have been taken in the later part of 1950, when the ’51 plates had come available. But on closer inspection of the photos I spotted two photos that showed the Jack Stewart 1941 Ford in the back ground. And in one photo I could clearly see that the interior had been installed. I have been involved in the research of the Jack Stewart Ford to help the restoration, and for my book on that car. 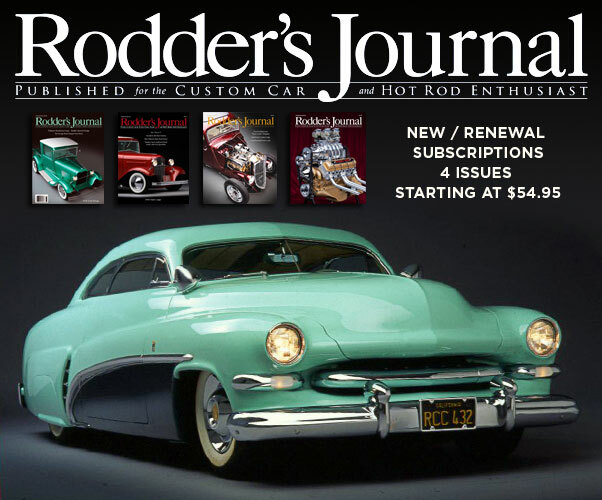 I know that Jack entered his ’41 Ford when it was almost finished at the 1951 Hot Rod and Motor Sports Show held from Jan 25-28, 1951 at the Los Angeles National AGuard Armory. 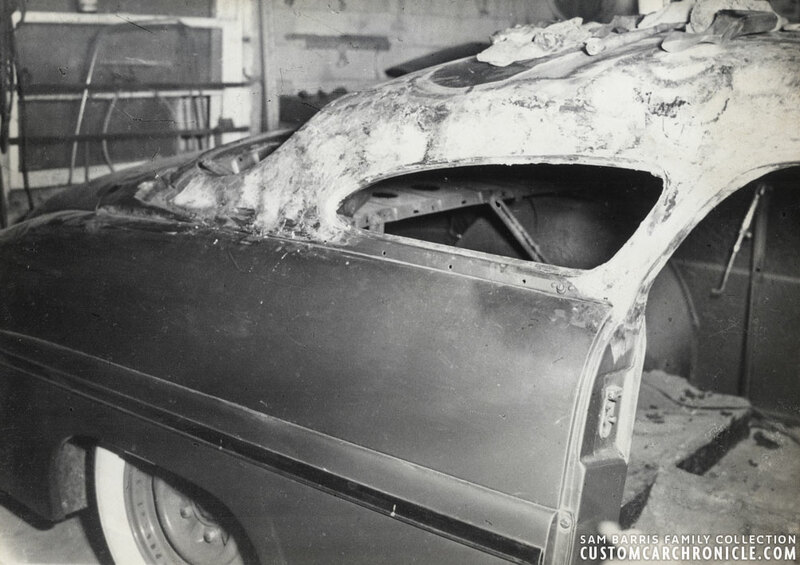 The interior was the only thing that had not been done, and the windows on the car were white-out to hide that from viewers. 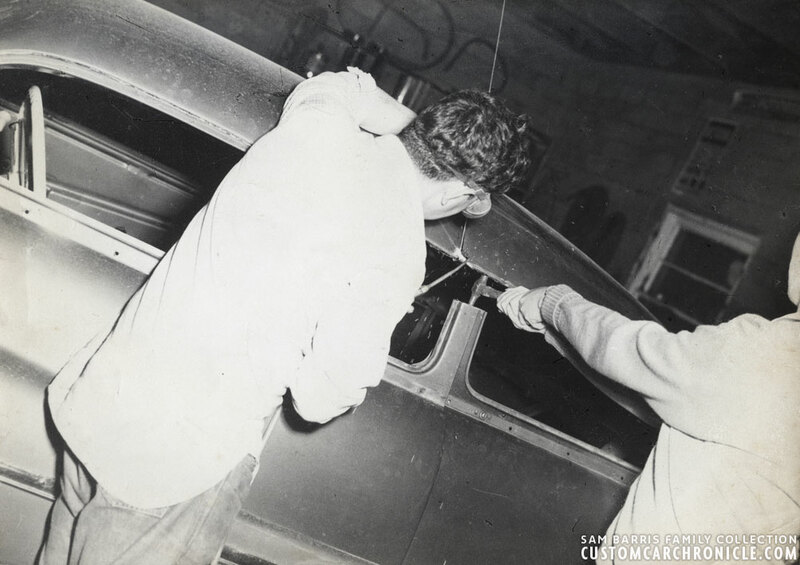 But in the photos Marcia had taken of Sam chopping the top on Jerry’s mercury there was an interior, so I knew these photos had to be taken after January 28, 1951. The Jack Stewart 1941 Ford with white out windows to hide the fact the car did not have an interior at the January 25-29, 1951 Hot Rod and Motor Sport Show in Los Angeles. In the top right corner of Marcia’s photo we can see Jack’s 41 Ford in the background. 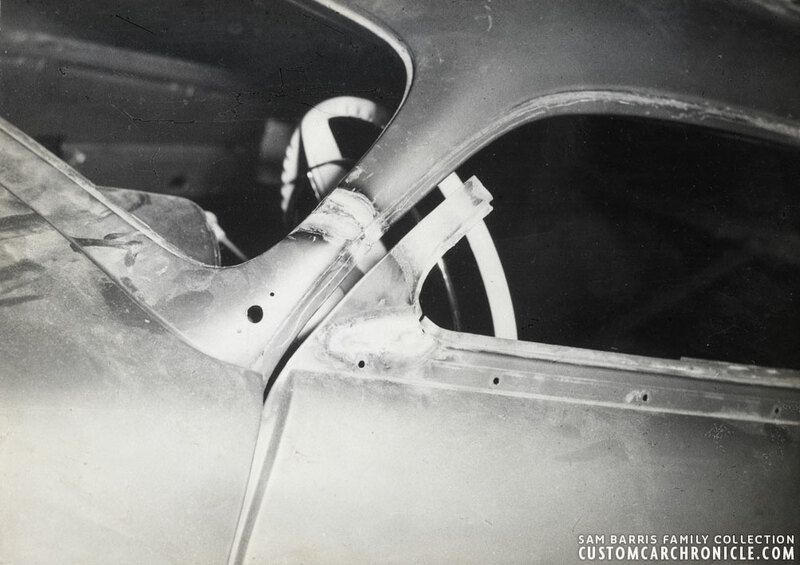 The photo shows the car with an interior, meaning the photo must have been taken after Jan 28, 1951. 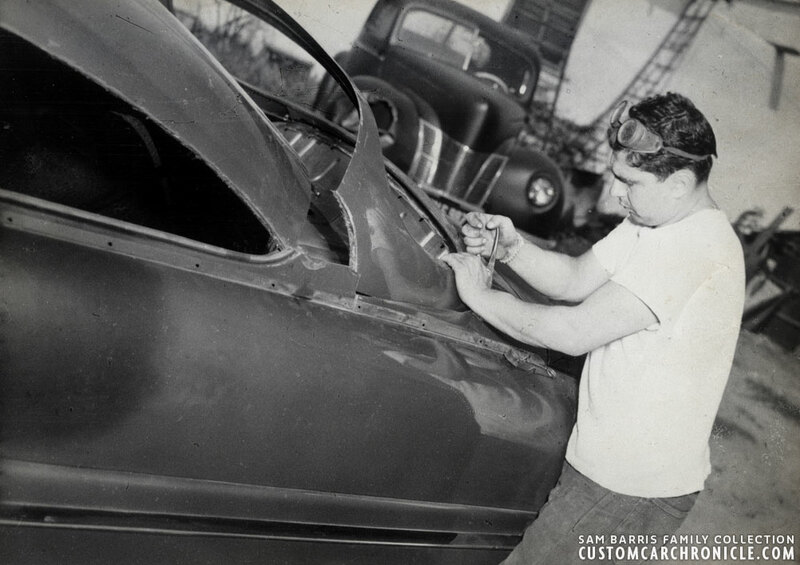 We know that Sam chopped Jerry’s Mercury and his own ’49 Mercury around the same time, according to people who were there at the time days or perhaps weeks apart, but that Jerry’s was done first and finished in white primer first. 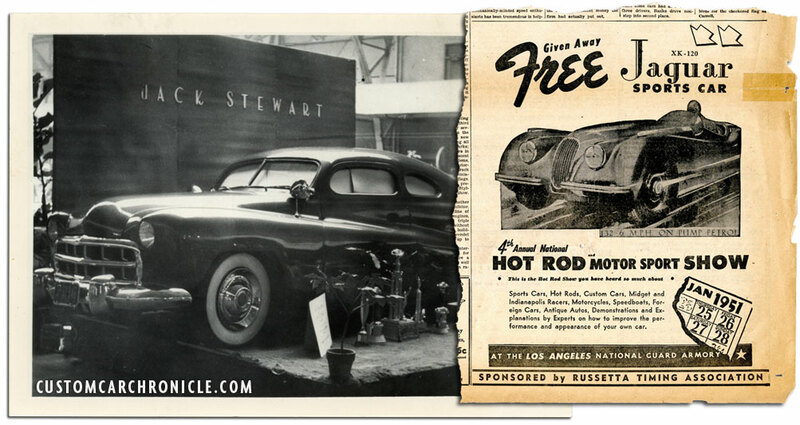 We also know that Sam Barris entered his ’49 Mercury completely restyled and painted (sans interior) at the 1951 Oakland Roadster Show, which was held from February 20-25, 1951. Which leaves the time frame for these Marcia Campbell album photos from January 29 till around February 19, 1951. A very short period for sure. But we know the Barris shop was capable of tackling a full custom job in a matter of weeks. The famous Hirohata Mercury was restyled completely in just 6 weeks! Wanted to enlarge a few sections of the photo of Jerry’s Mercury before it got chopped. This photo shows a few nice details that might not show up to well on the original size of the images in this article. Here we can see the hand made clear red lucite taillights in the rear bumper guards really well. 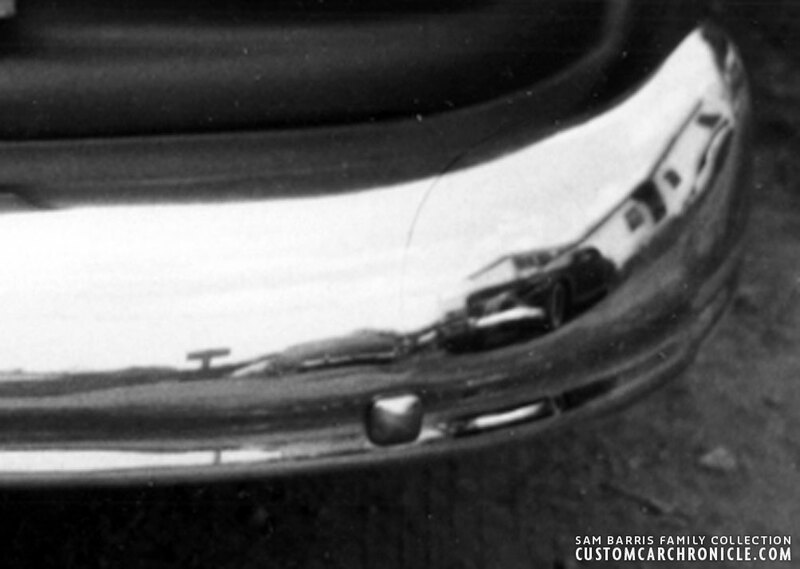 It also show the cars unique location of the bumper mounted antenna, plus most likely a heavily distorted mirror image of Marcia Campbell snapping the picture on the bottom right side in the bumper. The same photo also shows two parked cars mirrored in the rear bumper. The one of the right looks to be a ’40 Ford, possibly the same one as we can see in a few other photos. The one on the left could possibly be the Jack Stewart 1941 Ford. 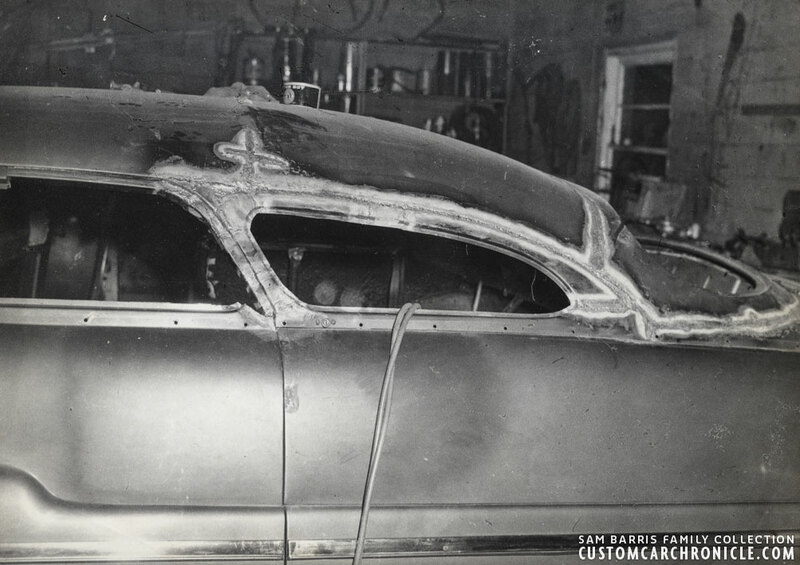 Marcia made for Sam the first photo sequence for his pioneering chop of the ’49 Mercury. As amazing as it is to have that seminal piece of our history, Rik Hoving is here carrying forward that work, in a photoessay to complete our understanding, More, to take us all back there beside Marcia with an insightful narrative on how it all was done “back in the heyday”. Can’t say enough in appreciation. Of what we are seeing. Of Marcia’s realizations of what was happening, and the need to document it. Of Rik’s analysis and explanations to fully ground us in understanding. Customizing has come a long way; CCC threads are showing us what can be done today with a host of technical improvements. But we all are humbled with how even the crudest tools and techniques could create true rolling sculpture, in the hands of a craftsman.